Trusted Companion is a ONE person service run by experienced carer Theresa Ingham, who draws on her years of experience with the ambulance service looking after the elderly. She says: “I was coming into contact with many people who just wanted a chat. I thought they must feel very isolated and I wanted to do something to help.” That drove Theresa to set up Trusted Companion and now she spends regular time with her valued customers who maintain their independence, yet enjoy her company and look forward to her next visit. Some especially when she takes Matilda her own trusted companion with her. 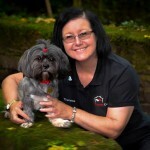 Theresa knows well the value of a four legged friend as pet therapy and Matilda – a wonderful Lhasa Apso – is a real source of delight. Trusted Companion offers a flexible, Caring, Support and Companionship service at Home or for a Shopping Trip, Day Out or a Hospital Appointment. She also provides Over Night Stays at very competitive prices. Fully DBS enhanced and a registered Dementia Friend. Dementia is often hard to come to terms with both for the sufferer and carer, you can be assured of the best care and enjoyable time for the ladies and gentlemen from Theresa who offers understanding, help and support. Skipton, Craven, East Lancashire, Ilkley, Keighley. Find out more about Trusted Companion's home care services.